Horning in on the action. Pulled out of hell by a Nazi plot, the red baby demon known as "Hellboy" now fights on the side of humanity. Though his giant stone hand may be the key to the apocalypse, he doesn't care - Hellboy's just a regular guy who happens to fight vampires, ghosts and ghoulies for a living. 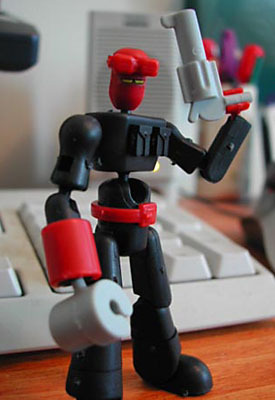 Most of the figure is made from the Supervillain set, except for the gauntlet, belt, and "horns" (actually goggles), which come from the Superhero set. A little red paint completed the look, and now all he's missing is a tail. Would you like to see licensed character Stikfas? Tell us on our message board, the Loafing Lounge.